Wasps are dangerous to your entire family. Their stings are extremely painful and they can scare children as well as adults into staying indoors. Eliminate wasps at their source and make it safe to go outside again. Wasps are dangerous to your entire family. Their stings are extremely painful and they can scare children as well as adults into staying indoors. Eliminate wasps at their source and make it safe to go outside again. Prepare yourself for angry wasps. Even if you approach a wasp nest at the right time of day and keep a respectful distance from the hive, one or more angry wasps may come after you. Wear long pants, long sleeves, a coat and gloves to protect your skin and a respirator or dust mask to protect your lungs from breathing in the wasp spray. The thicker the clothing, the less likely you will get stung. Use a projectile wasp spray in the evening when the wasps will be less active. These sprays will shoot up to 20 feet away from the can, making it far safer to kill the wasps. Stand far enough away to stay out of range of angry wasps while you spray the nest. Spray at an angle if you are spraying upward. Never stand directly below the place you will be spraying or you will end up covered in poison. Make sure to read the directions on the can. Saturate the nest with the poison, but keep your head turned to the side to avoid breathing in the fumes -- even if you are wearing a respirator or dust mask. Use a different type of spray for ground nests. Some types of wasps live in the ground, and a projectile spray will not work well to kill wasps underground. Look for a wasp spray that is specifically made for ground nests. It will probably be labeled for yellow jackets, which are one type of ground-dwelling wasp. You can also use kerosene in ground nests. Pour it directly into the nest to kill the wasps, but be sure to cover your skin thoroughly before doing so. Keep the queen from building a new nest in the spring. If you have not managed to kill the wasps during the summer or fall, the queen will survive the winter and will look for a new place to build a nest in the spring. Watch for a large and solitary wasp in the spring and kill this wasp before she has a chance to start a new colony. This is one of the most important steps in avoiding a large wasp infestation. Seal a wasp nest into a garbage bag if you want to kill a colony without the use of poison. This works if the colony is small and the wasps are not active at the time. Wait until night, then use a thick garbage bag to grab and hold the nest. Then close the top of the bag tightly to seal the wasps inside. 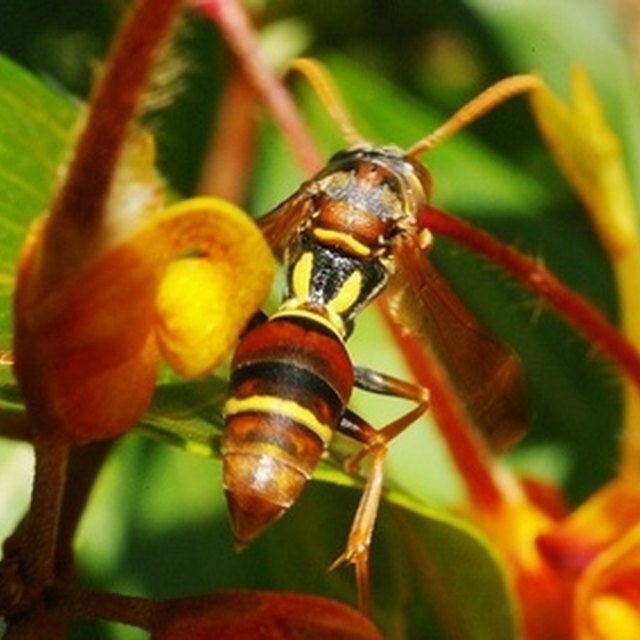 University of Minnesota Extension; Wasp and Bee Control; Jeffrey Hahn, et al.